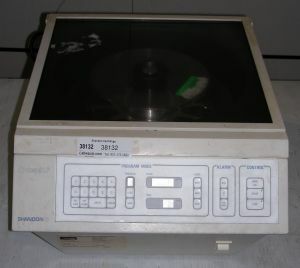 Product Description The Thermo Shandon Cytospin 3 is a low speed centrifuge used to separate and deposit a monolayer of cells on slides while maintaining cellular integrity. Cytofunnels load in a titled position preventing cell loss. The sealed cover protects the user from exposure to aerosoling pathogenic samples. Cytoclips load and unload easily without contact with samples. The Shandon Cytospin 3 offers a speed range of between 200 and 2000 RPM and has a holding capacity of up to 24 samples in 12 chambers. For optimized user experience, the Shandon Cytospin 3 features the ability to store up to nine centrifugal run modes to help increase overall efficiency. rotor included as pictured plus 12 sample clips. The Shandon Cytospin 3 can accommodate a wide range of samples with the use of Cytofunnel disposable sample chambers (not included), available in size options ranging from 0.1ml to 6ml. Cytofunnels load in a tilted position to prevent cell loss. They move to an upright position during operation to deposit cells. The Thermo Shandon Cytospin 3 is most commonly used in life science applications for hematology, cytology, histology, oncology, rheumatology, immunochemistry, microbiology, serology, and virology.